For our Western Washington Fans! Looking for some fun and free entertainment for your kids. 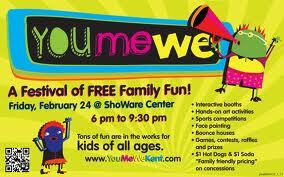 Head down to the Showare Center in Kent for the 2nd Annual You Me We Festival. Friday February February 24th 2012, 6-9:30 PM. Admission is FREE and it's for kids of all ages. Activities include: Bounce House, Face Painting, Games, Contests, Raffles, Sports Competitions, Hands On Art Activities. Hot Dogs and Soda $1 each. We took our daughter last year, she was three at the time and it was fun for her, she got a bunch of free junk that you throw away later and she got to bounce and play some games. It's fun if you can stand a bunch of kids running around.